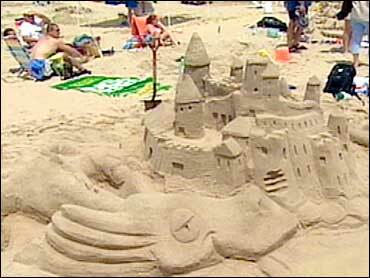 Joining the summer tourists at the beach this month was The Early Show correspondent Melinda Murphy who went to the 16th annual New Jersey Sand Castle contest in Belmar, where travelers are going more for the sand than for the waves. Murphy said some sand sculptors prepare for years, to come up with an extravagant project for sand. "I've never seen anybody as prepared as you are," Murphy told one graduate engineering student who competed. "Were you up, like, all week working on this?" she asked. "No, this is years of preparation...planning for this...building The Petronas Towers out of sand," he said while pondering over his creation. Others wait until they get on the beach for inspiration. "We don't come with any kind of plan," another contestant told Murphy. "We just let the sand talk to us and see what happens." Well he wasn't the only one with dreams made out of sand, Murphy said. One sculptor too young to drive created a sand sports car, complete with a key. While fantasies are the whole idea of the contest, many of the creations were pretty darn lifelike," she added. Murphy said saw castles with gardens, with dragons, and even with advertisements. And surprisingly, sand sculpting is retirement gig for some beachgoers. "You quit your job and this is all you do now," Murphy said to one contestant. "Six years ago, this is all I do," he said. "Holy Cow! that's cool," Murphy said. "It's a rough life, somebody's got to do it," he said. Finally, it was time for judging based on creativity, resourcefulness, originality and accessories. It was a tie for the best on beach, Murphy said. But not everybody celebrated that day, she said. As prizes were being awarded, the Petronas Tower came tumbling down. "Oh no, what happened?" Murphy asked the builder..."It just fell over, it just fell over," he said. Is it hard to build something beautiful and then watch it wash away? "It doesn't bother me," the contestant said. "It's something here for the moment that we enjoy, and that's it."